I met Chef de Cuisine Peter Goldklang after having a lovely Sunday dinner at The Parlour at the Roger New York in August 2012, two months after the luxury boutique 194-guestroom hotel opened after an extensive renovation. American Chef Peter Goldklang grew up in Westchester County in New Rochelle, New York, 15 minutes from New York City, and began his culinary career by graduating from the Institute of Culinary Education (ICE) in New York. From his solid base at ICE, he launched his career working at some of the top restaurants in New York where the list of award-winning chefs he worked with reads like the bold-faced names on "Page 6" of a New York newspaper. After a 4-month internship working with Chef Daniel Boulud at Bar Boulud, he worked at Chef Mario Batali and Restaurateur Joe Bastianich's restaurant, Tarry Lodge in Port Chester, New York, followed by 2 years working at Chef Jean-Georges Vongerichten's restaurant, JoJo. 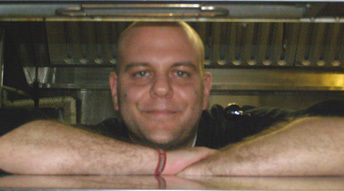 From there he went to work at the New York restaurant, Goat Town working alongside Chef Julie Farias. He said that learned a lot from working with Chefs Boulud and Batali, and from Chef Vongerichten who inspired him with his flavor profiles and fusion with French technique. However, he credits Chef Farias as being the hardest on him and the most influential day-to-day, as Chef Farias was instrumental in bringing him to the Roger, where he is the Chef de Cuisine at The Parlour since it opened in June 2012. In his free time, Chef Peter Goldklang likes to watch television cooking shows to learn about culinary trends and to look for inspiration. He graciously shares a delicious taste of The Parlour at Roger New York with his recipes and looks forward to welcoming you at the restaurant. Method: Combine all ingredients in a bowl and whisk together until well combined. To assemble: Slice mini brioches in half, brush each half with melted butter, and place on griddle until golden brown for approximately 90 seconds. Dip the oysters in the oyster milk and then coat with the breading and fry at 375° F (191° C) for 30-45 seconds (oysters should be golden brown yet still plump and juicy). Place approximately 1 tablespoon of the fennel slaw on the bottom brioche, place one oyster on top of the fennel slaw, and add 1 dash of anise liquor to each oyster. Top with approximately a half teaspoon of Kewpie Mayonnaise® and cover with the top bun. Use a toothpick to hold the Po Boys together. Use the remaining slaw as a side garnish. 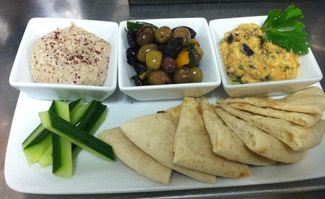 Chef Peter Goldklang serves the hummus as part of the Mediterranean Mezze, served with babaganoush, olives, and pita. Chef Peter puts his signature on this classic recipe with his addition of roasted garlic, lemon and orange juice, lemon, orange, and lime zest, as well as sumac spice, to the usual hummus ingredients. Method: Combine all ingredients in a food processor until smooth, and then push through a fine mesh strainer for a creamy consistency. 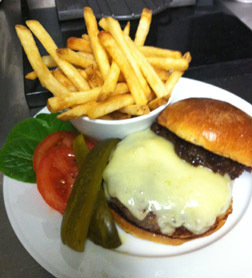 Chef Peter Goldklang serves this tasty onion jam on The Burger made with beef short rib, and New York cheddar, as well as on the Flat Iron Steak Sandwich served with arugula and garlic aioli. The jam would also pair well with a cheese course, or to use as a topping on crostini. Method: Sweat onions in olive oil slowly for approximately 2 hours, constantly draining excess liquid. When the onions are fully sweated, add the balsamic vinegar and the brown sugar. Stir until well combined and keep on the stove for one hour until the onions are a very deep brown and the consistency of jam. The ambience at The Parlour is comfortable and casual, with round marble-topped tables dressed with votive candles, blue leather chairs, and navy and white striped banquettes. 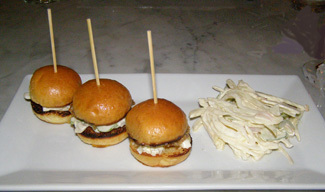 The bistro-style menu consists of interesting small and large plates, and a selection of desserts. 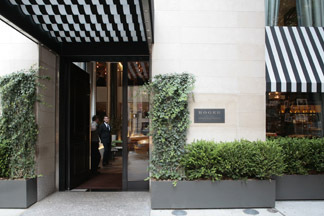 Read other materials on the Roger New York in the Restaurants and Hotels and Resorts section. Read other materials on New York in the Destinations, Hotels and Resorts, and Restaurant sections.